The Halloween tradition of trick-or-treating has really become a way for children to exploit their neighborhoods for free candy. But the origins were that the children would receive either a treat or perhaps a trick – a prank or something undesirable. This match was closer to that version of Haloween. Juventus got their treats, and Milan got tricked into keeping their coach despite yet another poor result. It must be said that Milan did get one treat, by pranking the mighty Juventus. 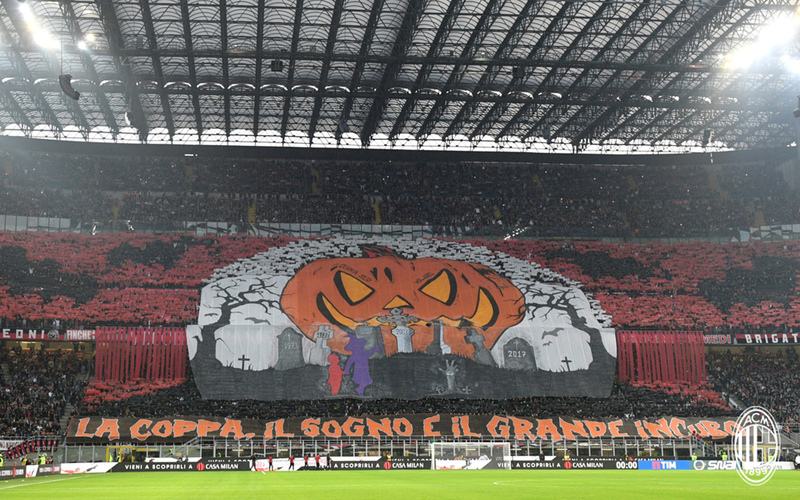 Milan’s coreo was unparalleled in trolling the seven time Champions League final losers. 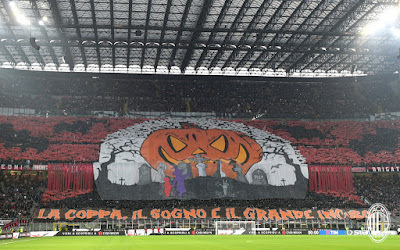 The Halloween themed artwork was brilliantly displayed with the words “The Cup, the Dream, and the Big Nightmare.” The graveyard included a tombstone for each of Juve’s Champions League final losses, with the 2003 loss in Manchester to AC Milan prominently displayed in the center. Even better that it was displayed at the same time as "O Generosa" was playing, with the patronizing lyrics blasting "Winner you'll be in your heart" as if to troll them further for their endless losses. It was more delicious than buckets full of candy, and absolutely took the edge off of the inevitable result of the match about to be played. Grazie, Curva Sud. You’re terrible at politics and humanity, but brilliantly unparalleled as artists. I would say that the coreo was the end of Milan’s enjoyment for the night, but it actually wasn’t. We started off completely dominating Juventus and pinning them back. That lasted for at least six minutes, so that’s when I worked in all of my smack talk. That was good, because with Kalinic as the only player to take shots on the night, there wasn’t going to be anything else to brag about. Why he was deployed instead of other strikers, or with Suso again in his very unnatural position as support striker is beyond me. And even if Juventus specifically targeted Suso and shut him down, we saw what Suso could do midweek when Montella used the 3-4-2-1 and he was given more space. So why change it? Why go back to the stifling 3-5-2, which has given us more losses than wins? Why not play Kalinic with Silva, which was absolutely magical the ONE time Montella used it? This loss, as with the others, is on him. In the 23rd, we suffered our first blow in an Higuain goal. 1-0 Juve. It came, as usual, from an error in the midfield, and our center backs to slow to even react and stop the maligned Juve striker. We saw Kessie get a deserved yellow in the 32nd, we have to remember he is much younger than he usually plays. It seemed that we would even the score just into stoppage time when Calhanoglu, with his back to Kalinic, sent an impossible header straight to the “striker,” who settled it, took the shot and hit the crossbar. If he couldn’t convert that tasty piece of play, it was not going to be our night. And if he had scored it, we would be talking about the goal and the assist right now. The second half is where Montella really trolled everyone. Most coaches make subs to impact the game in their favor. Not Montella. 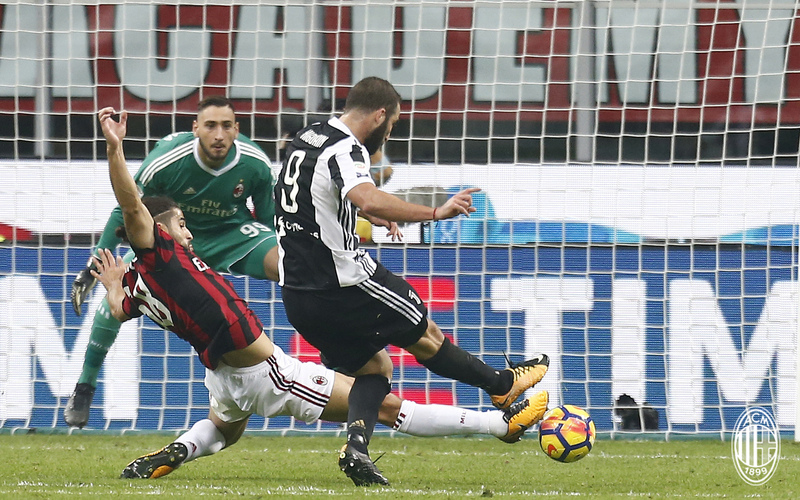 He made not one, but two subs in the 61st – so early for him – and the result was another Higuain goal, just two minutes later. 2-0 Juve. I didn’t even know that was possible. Two pairs of fresh legs, and we couldn’t stop that from happening. Unbelievable. Equally unbelievable was that Montella wasted two subs on non-attacking positions in a game where we had been defending well, but needed a goal. Perhaps he was still distracted by the incredible coreo? I will tell you who was brilliant in this match: Valeri. He kept the game running smoothly. A lot of fouls, but only two cards. And no controversy. When was the last time we played Juventus that you could say that? It was incredible. Good football (not great, but good) from both sides and no controversy. So while the result stings bitterly, this was at least a silver lining. And despite Milan maintaining 54% possession and actually having more shots than Juve, with 12 shots for us, a couple of errors cost us all three points. But did anyone ever really see us taking those three points? I mean we did pin them back, limit their chances, and still create chances of our own. We simply lacked a clinical finisher, such as one of the two young brilliant strikers on our bench, Silva and Cutrone. But that, again, is on Montella. 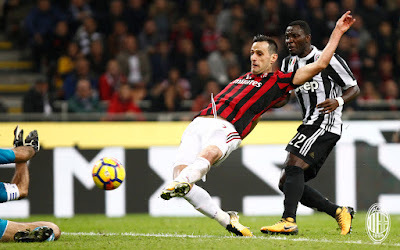 Despite a brave Milan performance, an improved performance in spite of Montella’s incoherent tactics and personnel choices, we have now lost five of our first eleven league matches. No way that’s going to get us to a top four finish. Let me rephrase that: No way Montella is going to get us to a top four finish. But until Halloween is over, and perhaps every other holiday this season, our management are apparently going to treat us like children: Trick or Treat.